A & MT Elegant Venice lace Linen placemats:12 x 18" OB. Set of 4 Pcs. Material:100% polyester: beautiful Venice lace embroidered design placemats. Color: Beige. Set of 4 Pcs. Imported; Machine wash,iron on the lowest setting if needed ,Matching placemat, table topper, table runner and tablecloth available. This beautiful Embroidered Rose Cutwork Placemat has a beige background with abundant embroidery and cutworks scattered on it. The multi-color embroidery is in peach, pink, yellow, green and beige. 100% polyester. Perfect decorations for your dining table, dresser scarf, coffee table runner, or even bed runner. Place of Orign China(mainland). Color White. Material 100% polyester. 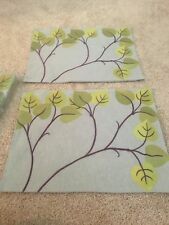 I have ten placemats that are new never used. Sferra Perry Linen Placemats White Oyster Set of 4 ​14 x 20 New Includes: 4 OBLONG PLACEMATS;14 X 20 WHITE OYSTER 100% Linen CARE: MACHINE WASH IN WARM WATER , GENTLE CYCLE NO BLEACH New in Original Package. EMBROIDERED PUMPKINS. 14 PC PLACEMATS. I LOVE HAVING EXTRA PLACEMATS JUST IN CASES EXTRA PEOPLE SHOW UP OR THEY JUST GET STAINED UP. COLORS: GREEN CHECK AND MULTI COLORED. BEAUTIFUL AND WELL MADE AND VERY NICE QUALITY. 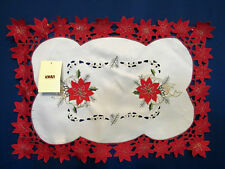 Your table setting will look beautiful in these delicate opencut embroidered lace placemats. Designed with the class of antique heirloom table linens with modern sophistication, the opencut work creates a sheer and airy look perfect for spring or summer. Thea Dora Collection Size: 14 inches wide x 19 inches long Fiber content: 100-percent polyester Product care: Spot clean or wipe with damp cloth Setting size: Sold in a set of 4 pieces Design detail: The opencut design creates an airy, sheer look. Embroidered design table linens. These two-tone placemats and runners add a colorful and vibrant touch to any table.These table linens come in two color choices, each with sophisticated white embroidery and underlay. The set of four 100 percent polyester placemats is perfect as a decorative and functional addition for your indoor dining table, pulling together the design elements in your space while welcoming diners to the table.Colors/finish: Khaki, plumMaterials: 100-percent polyesterQuantity: Four (4) placemats, or one (1) runnerSetting: IndoorDimensions: 20 inches long x 14 inches wide (placemats) or 70 inches long x 16 inches wide (runner)Embroidered, two-tone. Holiday Holly Collection, beautifully embroidered designs that will take a simple dinner and transform it into a holiday feast. These placemats are perfect for everyday entertaining. Shape: oblong Care instructions: spot clean Exact color: white Type: placemats Set size: set of 4 Materials: 60-percent linen, 40-percent cotton Setting: indoor Dimensions: 20 inches long x 14 inches wide Holly, embroidered, placemat.